According to two independent analyst reports, Blackberry Z10 sales have been far lower than expected. This is in stark contrast to early claims of strong sales & sell-outs. This launch "hype cycle" seems very similar to that of the Nokia Lumia 920. Based on retail and supply chain checks, Canaccord Genuity has cut their Q1 BB10 shipments by 83% - from a wildly optimistic figure of 1.75 million to just 300,000 units. 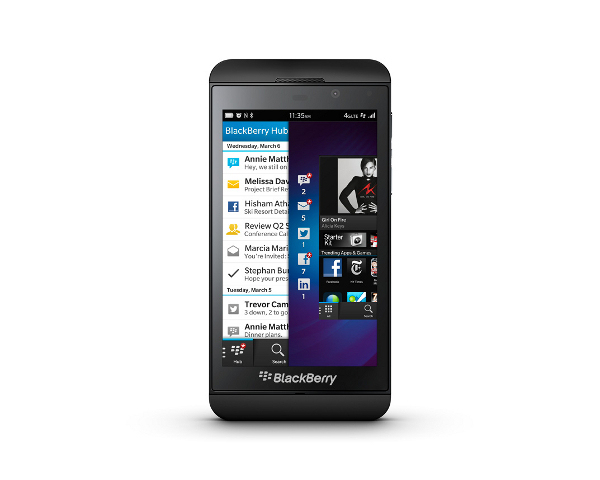 Our global surveys post the recent BlackBerry Z10 launch indicated mixed initial sales with limited initial supply cited as the reason for early post-launch stock-outs at some carrier stores rather than overwhelming demand. Our follow-up checks have indicated steady but modest sales levels. With new BB10 smartphones launching in the U.S. only in mid-March or later at subsidized prices no better than competing high-end Apple/Samsung smartphones, combined with our expectations for the Galaxy S IV to launch at a similar time frame in the US market, we are lowering our BB10 sales estimates for the February quarter and all of F2014. We believe carrier support for BlackBerry 10 in the U.S. is modest, as demonstrated by Sprint only planning to launch the Q10 and T-Mobile only the Z10. Further, we anticipate carriers will not build large inventory levels for BB10, consistent with prior BB7 high-end launches, and will initially stock modest levels given the weaker consumer demand for high-end BlackBerry smartphones. With our expectations BB10 smartphones will face increasing competition from a host of new Android and Windows smartphones and potentially a new iPhone in 1H/C2013, we anticipate global carrier partners will order cautious initial BB10 inventory levels, leading us to lower our Feb. quarter and F2014 BB10 estimates. Pacific Crest has also conducted their own retail checks, which indicate 275,000 to 325,000 shipments in Q1. We believe the Street has gotten ahead of the potential reality for BB10 shipments. There is no line of sight to profitability; we remain sellers of BBRY. Any benefit from the Z10 is likely to be at least partly offset by cannibalization of Bold 9900 sales, which our checks indicate have declined materially since the Z10’s launch. Applying normal rates of decay in launched markets and assumptions for channel fill in the United States, we believe the company is likely to ship-in roughly 1 million to 1.5 million units in the May quarter. We estimate Street expectations are for roughly 3 million to 4 million units. We continue to believe the Z10 launch involves relatively small shipment volumes and only moderate sell-through so far in markets which have historically been some of BlackBerry’s strongest. As a result, investor optimism that the BB10 could reverse the company’s trajectory appears to be well overdone at current levels, in our view. To achieve sustained profitability, we believe the company would need to ship roughly 3x to 4x more BB10 devices than we anticipate on a quarterly basis. We remain skeptical that BlackBerry has any reasonable path toward achieving these kinds of shipments. In contrast with BB10's average shipment estimate of 300,000 units, Nokia's Lumia devices registered 1 million shipments in their debut quarter (not exactly a rousing success). I wouldn't say I'm surprised by these figures, as I always expected Blackberry 10 to fare worse than the Lumia portfolio. For Blackberry 10 to have any shot of viability, the devices should have been released at lower price points, targeted at emerging markets. Without that boost, Blackberry has no shot of achieving the required 3x to 4x the estimated BB10 sales - although, I assume that multiple would be much larger at lower price points & margins. In any case, as I said, Blackberry 10 is too little, too late. I suspect you will be proven incorrect, as will the two quoted analysts. Though we are both just guessing until the numbers are out on March 28th. Multiple sources have revealed the 300k shipped number to be laughable at best. Production was 500k/month in December. This was ramped up to 1-1.5mln in January, and Thorsten indicated that he had it ramped up again in February to keep up with demand. This would suggest, at least, 1.5mln have been sent out to the channels and if they have been efficient with the February production it could be in the 2-2.5mln range for sell-in. Sell-through would be the other metric, however, all actual channel checks have indicated that retailers, by in large, are awaiting stock replenishments. Interesting. Do you have a source for these figures? If those numbers are accurate, BB10 is certainly at least an early success (far more that the original Lumia). However, at least so far, I haven't seen any evidence of that. Looking forward to the earnings announcement. I'm not sure if they will reveal the total number of Blackberry 10 shipments, but the overall shipment figure should give us some idea.